Hyggelig Lesson number 3: In the previous two lessons I have tried to conceptualize and describe what hyggelig is. However, one can only partially explain an intangible concept – this lesson is therefore going to be a story about a hyggelig Sunday. This Sunday we had some friends and their children over for lunch in our allotment garden. 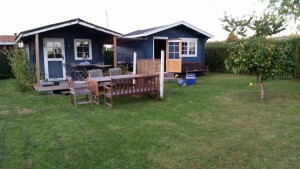 (This miniscule space is our “summer house”. It’s just a fifteen-minute walk from our home!) This was our friends’ first visit to our garden, so we were excited. We love this place and find it incredibly hyggelig with all the flowers, the apple tree, our kitchen garden, outdoor kitchen and our little hut complete with a sofa bed, table, armchairs and more. And, believe it or not, the space is still not crowded. When we need to relax and escape the daily grind, we go to our allotment garden. Some deliberations went into what we should serve for this Sunday lunch, as we did not want to spend the entire day preparing the food instead of spending time with our guests. Also, it needed to be something we could cook on either the grill or the gas cooking plates. Based on that – and on the fact that two of our guests were 3 and 6 years old – we decided to make homemade pizzas on our pizza-stone in the grill. While we were making the first round of pizzas, the kids were running around in the garden, having a great time playing soccer or throwing ball with our puppy. Once the first two pizzas had been served – the worst hunger pains banished – our 6-year-old guest made the next pizza. It was easy having him in the ’kitchen’, as all the ingredients had been cut and prepared; he could just pick and choose what to top the pizza with. 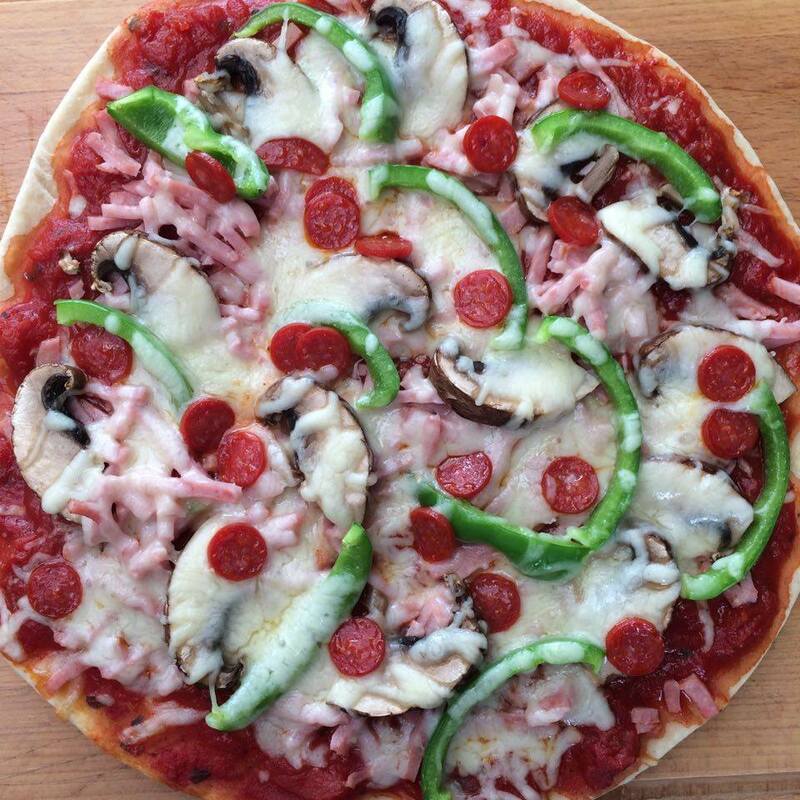 He decided to make what he called a ’man-pizza’, which meant everything meat and a whole lot of cheese – NO veggies! Unfortunately I didn’t get to take a picture of this man-pizza, as he was so excited to taste it. 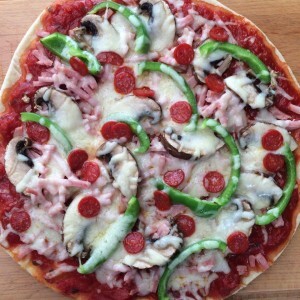 The picture below is of the one I made; ham, cheese, mini-pepperoni, green peppers and portobello mushrooms. It is definitely not the last time we are making pizzas on the grill. Stay tuned for Hyggelig Lesson number 4 in two weeks. In between this blog and the next hyggelig-lesson, Annette will be visiting us in Denmark, so we’ll be bringing hyggelig together in person.